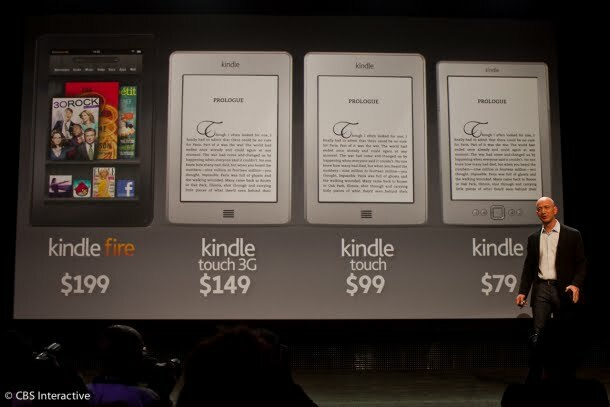 Amazon today showed off three new versions of its e-ink digital book reader Kindle. The company unveiled the Kindle Touch for $99. It also showed off a 3G version, which will sell for $149. A cheaper and smaller non-touch control Kindle will sell for $79. The lower price points represent an aggressive push by Amazon to further its lead in the e-reader market as other entrants such as Barnes & Noble's Nook pose a growing threat. The Kindle Touch is thinner, smaller and lighter. It features no physical controls, allowing the user to use their left hand to navigate through a digital book. Amazon CEO Jeff Bezos touted the new price points, saying Amazon is "making premium products at non-premium prices." Amazon.com Inc. on Wednesday unveiled the Kindle Fire tablet, the latest--and possibly biggest--challenger to Apple Inc.'s dominant iPad. 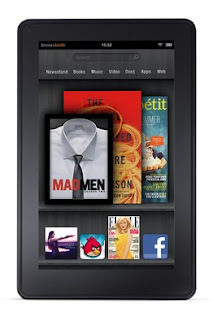 The Fire tablet has a 7-inch screen and can access Amazon's app store, streaming movies and TV shows. The device will cost $199 and will be available Nov. 15, with pre-orders starting Wednesday. By comparison, the lowest price for a new iPad is $499. The Kindle doesn't offer a cellular connection, working only with wi-fi. It also doesn't have a camera or microphone. "We asked ourselves, 'Is there some way we can bring all of these things together [web, movies, apps, books and games] into a remarkable product offering customers would love?'" Amazon Chief Executive Jeff Bezos said at the company's launch event in New York City. "Yes, the answer is Amazon Kindle Fire." Bezos noted that all the content on the Fire will be backed up remotely on Amazon's servers at no cost to the consumer. "This is unbelievable value," Bezos said. "I really want to stress this point: These are premium products at nonpremium prices."